Whether you have suffered an injury in a shopping mall, a parking lot, or even in a government building, the factors that affect the settlement value will be the same. 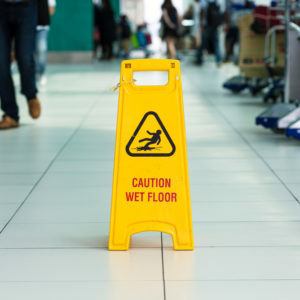 This does not mean that a settlement amount will be easy to calculate because each slip and fall injury will have a unique set of facts that will impact the damages. At the Salamati Law Firm, we understand the system and have helped slip and fall victims throughout California obtain maximum compensation for their injuries. Some clients want to know if there is an average settlement for a slip and fall injury. There is no standard calculation that can determine the value of slip and fall compensatory damages. However, California law recognizes the right of a person injured by someone else’s carelessness to be made whole. This means they may recover compensation for many categories of losses so they may be restored to their prior condition. The simplest way to understand the categories of damages in slip and fall cases is to break them down into economic losses, non-economic losses, and in rare cases, punitive damages. Settling out of court can save the parties the time, expense, and stress of trial. However, it may also prevent a plaintiff from receiving full compensation. If you are injured in a fall on someone else’s property, there is a good chance an insurance adjuster will contact you very early on to sign paperwork and receive a settlement check. But that paperwork will contain a release – that means if you have more medical bills or disabilities caused by the injury that you were not yet aware of, you can never recover those from the at-fault party. An experienced slip and fall attorney can evaluate the situation to determine whether an out-of-court settlement takes into account all of the reasonably anticipated bills. If a fair settlement cannot be reached, Sean Salamati is prepared to go to bat for you in court. The slip and fall settlement timeline truly varies from case to case. A settlement can take place very quickly, within weeks of the accident, or the process can take several years. It may be tempting to accept an early offer from an insurance adjuster but know that these come with strings – when you sign a settlement, you agree to release any other claims against the other party that are related to the claim. This means if you discover after you settle that your sprain is really a fracture and you will suffer some degree of permanent disability, you cannot go back to recover more compensation. The Salamati Law Firm puts the needs of clients first. We never waste time in getting clients a settlement but we make sure that settlement takes into account the full scope of the injuries. And if necessary, we are willing to go to trial to ensure clients get what they deserve. A slip and fall injury can set you back physically and financially. That is why we aggressively fight for your rights and ensure that a settlement encompasses all of the losses you have and will suffer. Call 1-888-259-4060 today to schedule a free consultation with Los Angeles slip and fall lawyer Sean Salamati to find out how we can help you. California Legislative Information, Civil Code § 3294 Exemplary Damages, https://leginfo.legislature.ca.gov/faces/codes_displayText.xhtml?lawCode=CIV&division=4.&title=2.&part=1.&chapter=1.&article=3.